Hotel Booking System For Magento is a module which helps in developing your Magento Website into a Hotel booking website. This module helps in managing the rooms of a hotel or other lodging facilities and you can display a number of available rooms with facilities and their per day rates online to your customers. With the help of this module, you can add multiple hotels with various kinds of rooms, provide various services or amenities to your customers. This hotel booking module also enables the customers to pre-book the rooms and search rooms by various parameters like price & amenities. You can create multiple Groups and Room types which you can use as a template while adding any new room. Admin can create multiple Room Types and Groups. 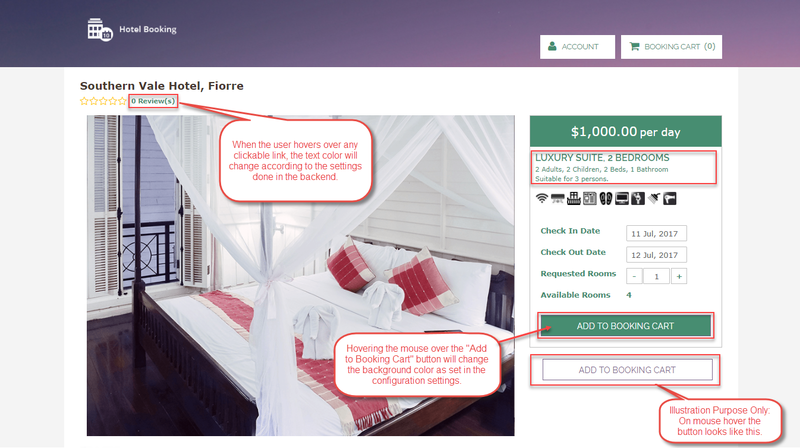 Admin can create multiple Hotels and Rooms. Customer or buyers can do pre-bookings for the Hotel rooms. 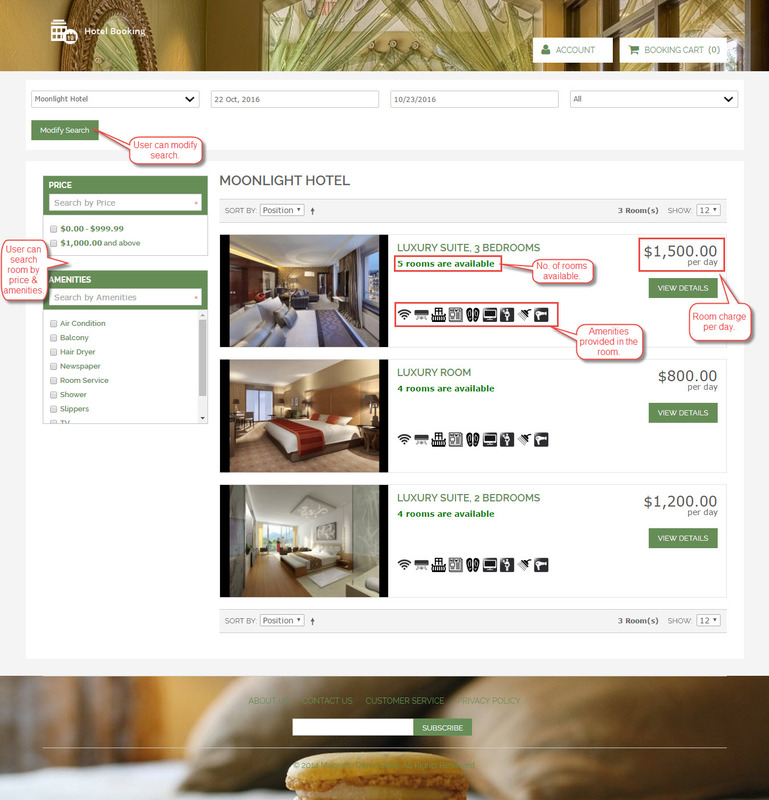 Customer can filter the price and amenities by Ajax layered navigation. Admin can set the percent for the pre-booking. Admin can enable or disable the pre-booking feature. The customer can search or filter the rooms by price range and amenities. The customer can see room images, per day charge, room availability and amenities provided by the Hotels. Availability Calendar is present which display number of rooms available on particular date. 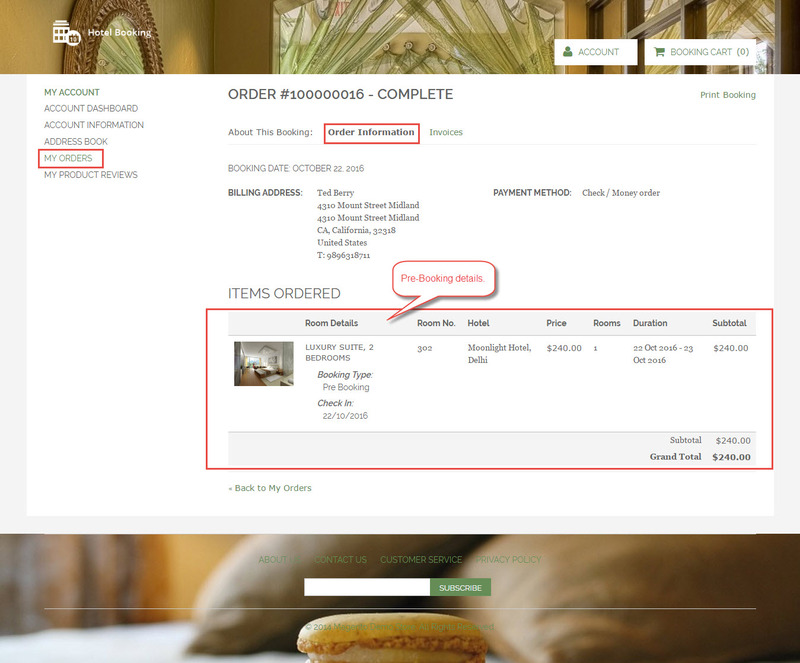 On the checkout page, the customer can see Room details, Hotel name, cost per day, the number of requested rooms, Booking duration, the number of days and sub-total. 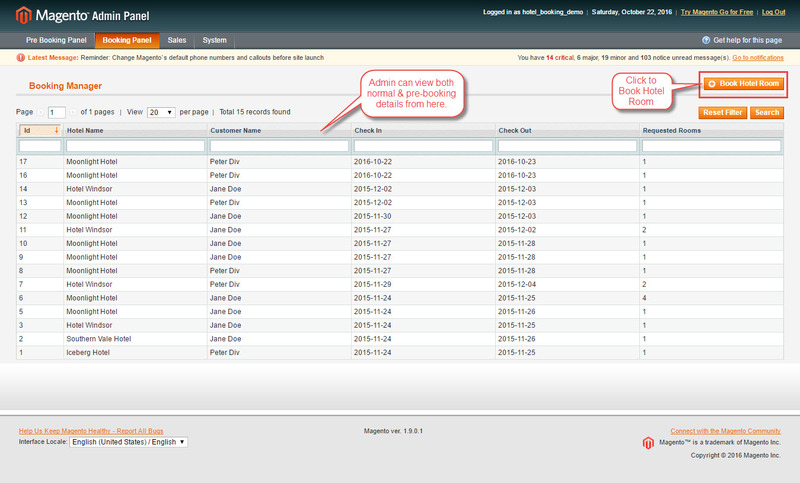 Admin can do the normal booking from the back-end as well. 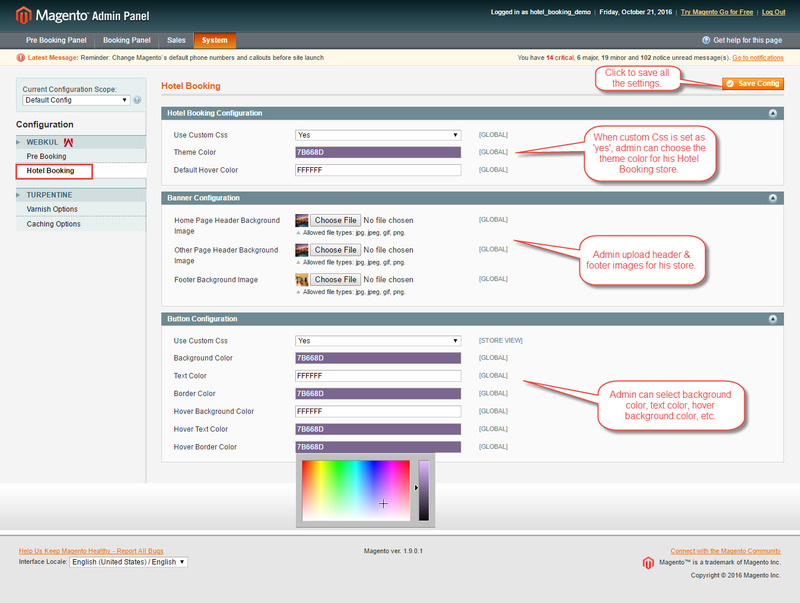 Admin can customize the store theme. 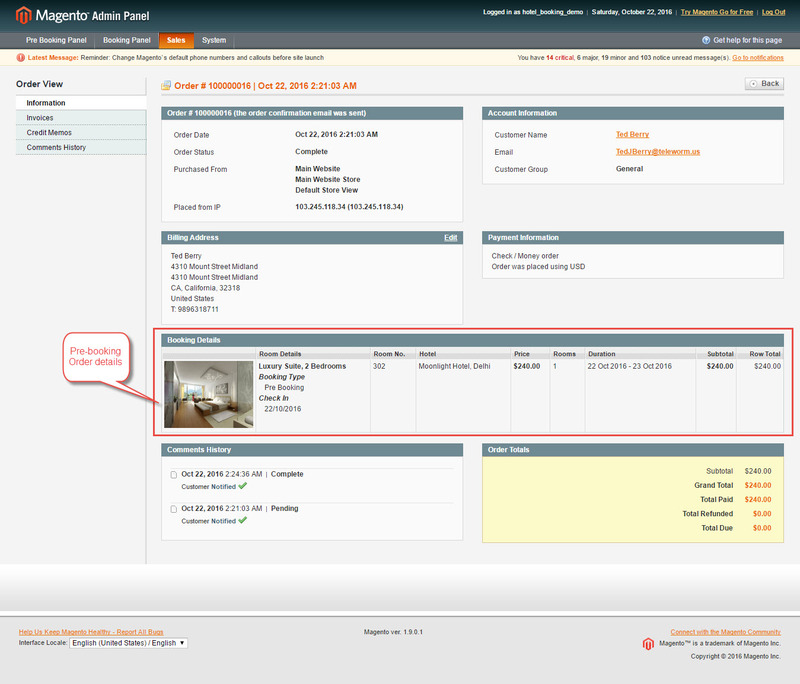 Installation of Hotel Booking System For Magento module is very simple. You need to move all folders (app, skin) into Magento root. After moving both the folders flush the cache from Magento admin module. Under System > Cache management. To use this module, first you need to have online hotels and you can create online hotels by going to Booking Panel > View Hotels. 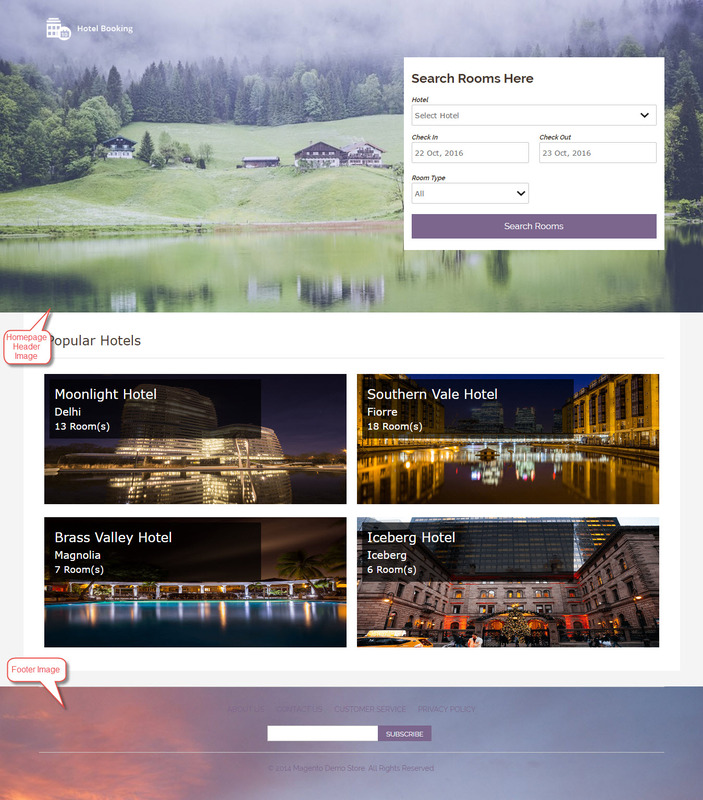 Under the “View Hotels”, you can see a grid containing Hotel names, Checkin, and checkout timing, address, city, country and an option of creating new hotel also. When you will click on “Add New”, then a new page comes where you will fill details like name, address, city check in and check out timings and Hotel Policy. After adding online Hotels, now you have to create various rooms which will be provided to the customers. Creating rooms is very easy. Just go to Booking Panel > Manage Rooms like the image below. Here, you can see a grid displaying room names, room id, price, edit link and an option for creating a new room. On clicking “Add New”, a new page opens where you can select room information like Group and Room Types. For creating a new group, follow the path Booking Panel > Manage Option Group. Here you can see a list of already created groups with an option of adding new groups under “Add New”. After clicking on “Add New”, you will enter various fields and select multiple amenities which you want to provide for that Group. There are few unassigned options as well which can be added as a part of the amenities by Drag & Drop. 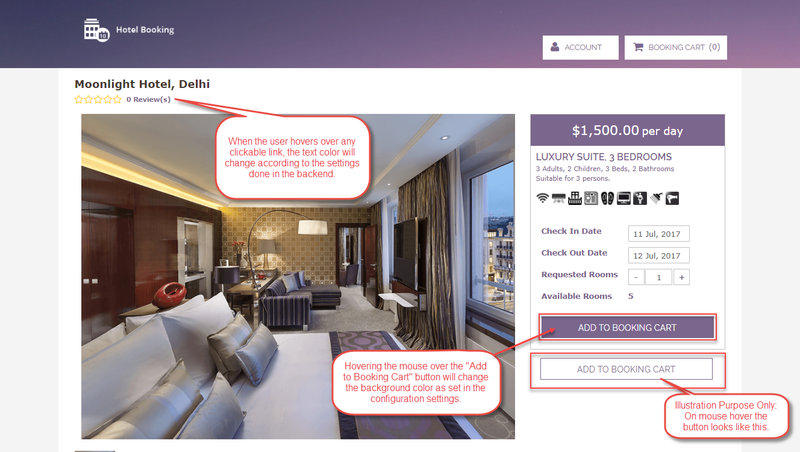 For adding a new Room Type, go to Booking Panel > Manage Room Type. You can see grid displaying various Room Types and their respective status. There is an option of adding a new Room Type under “Add New”. After clicking on “Add New”, a new page comes up where you have to enter Name and select the status from the drop-down. 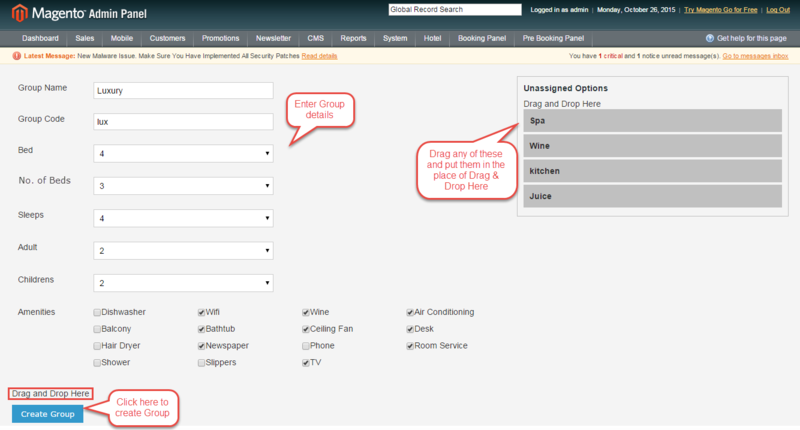 After selecting the Group and Roon Types, enter a name, description, and other information. It is just as adding a normal Magento product. Enter price per day for the Rooms. 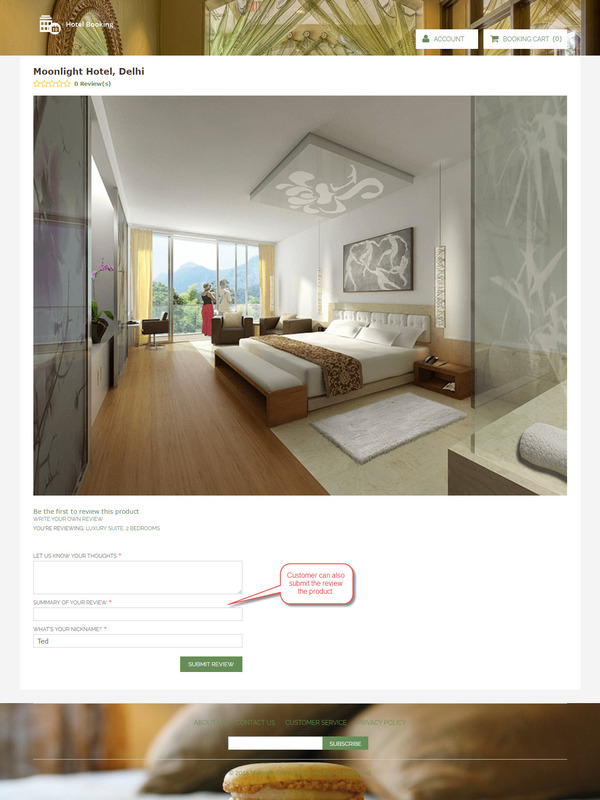 In the “Room Information”, select the hotel from the drop-down and enter room numbers. Please check the image below. After adding the new room, you can see that room in the grid as well. 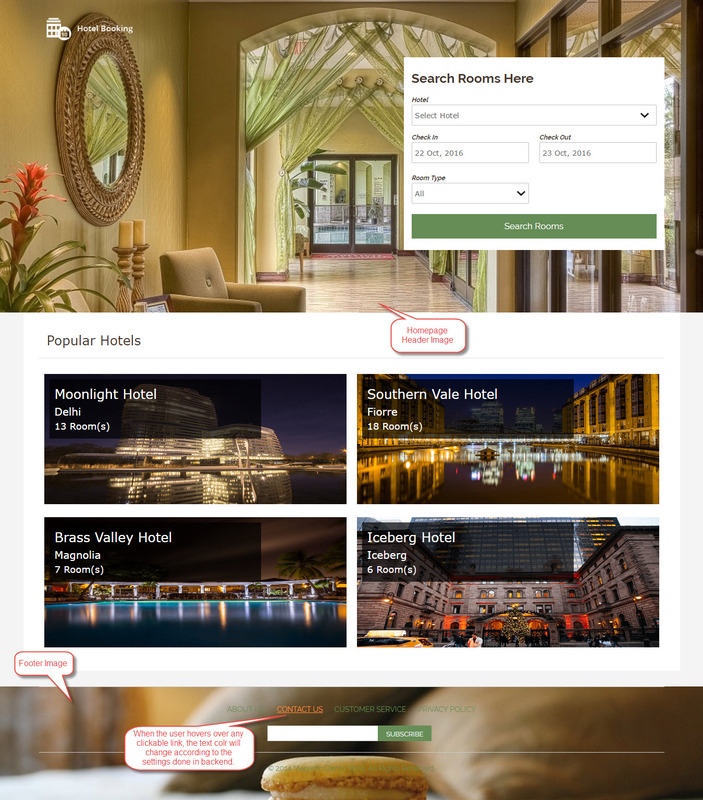 Admin can create a theme for his Hotel Booking System store using various colors, text colors, and header & footer images for his store. 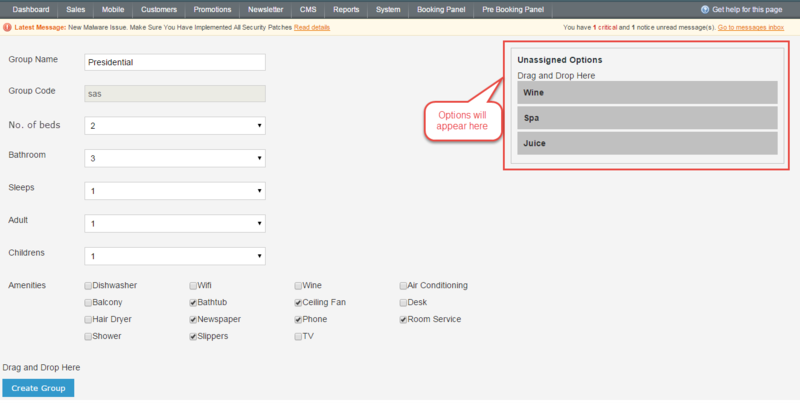 Admin can do these configuration settings by going to System –> Configuration –> Hotel Booking. 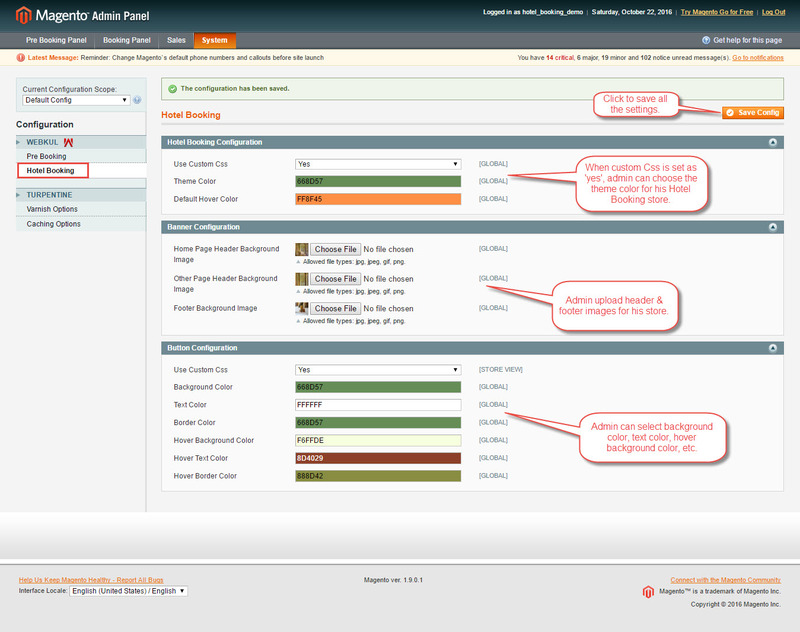 According to the theme colors and images that the admin has chosen, the frontend will show the changes made. After the installation and configuration (admin rooms and hotels), you can see a wonderful page on the front-end like below image. Here you can select Hotels from the drop-down, select date from the calendar, enter the number of days and select room type from the drop-down. After clicking on “Search Rooms”, you will be re-directed to a new page. Here you can see all type of rooms available for the selected hotel, number of available rooms with amenities provided for each room types and charge per day. You can ever re-define your search in terms of price and amenities by the filter provided at the right-hand side. In the “View Details” page, you can see info like room name, check-in date, requested days, available rooms. In the booking option, you can either go for pre-booking or make full payment. In the Additional option, you can check for any extra feature as well. There is an Availability calendar, where you can see a number of rooms available for each date. At the footer, you can check the Hotel Policy, Additional information. 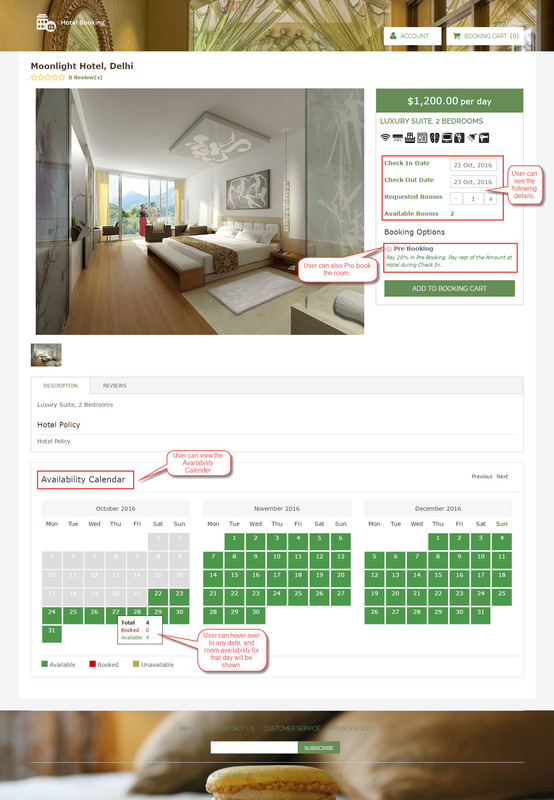 In the Availability Calender”, the customer can check the total number of rooms, booked room(s) and available room(s) for any date on which they want to book the room(s). After selecting the desired room, you can proceed to the checkout by clicking on “Add To List”. 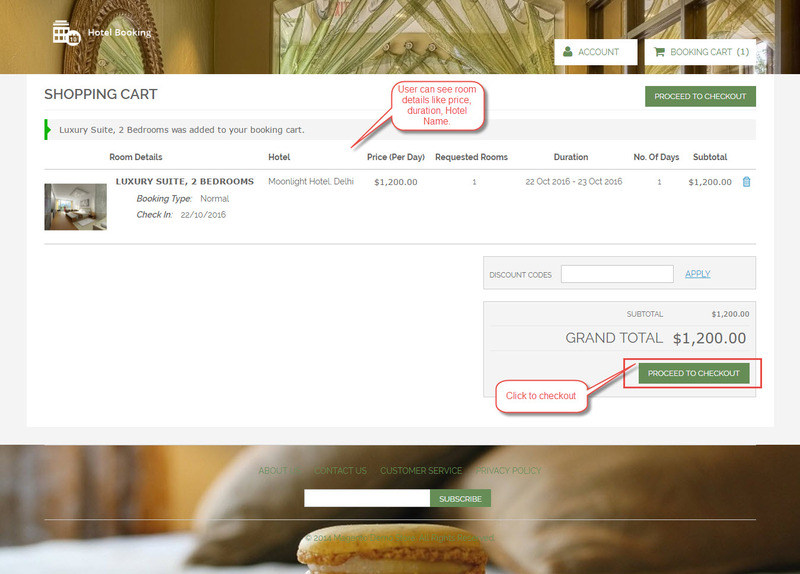 In the Shopping Cart page, you can see your room details and sub-total amount. The customer can also provide their rating and reviews for the room and their services like the image below. 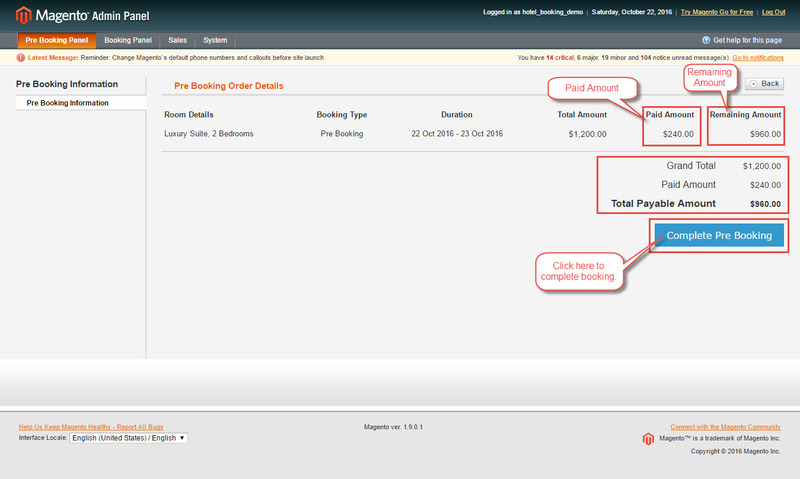 After booking the room, the customer can see the booking details and their invoice. Admin can see the booked rooms under “View Booking”. Here admin can see Pre-booking details and normal booking details. Admin can also book a room from the back-end as there is one option called “Book Hotel Room”. 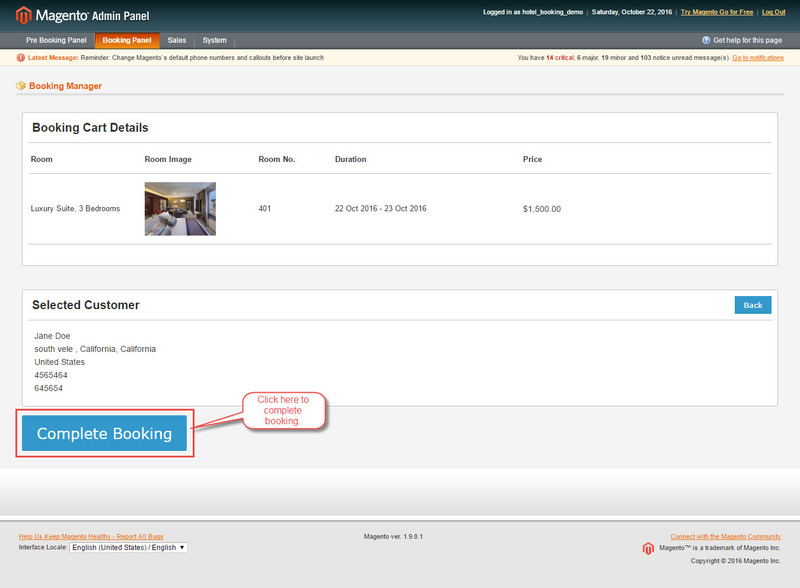 On clicking “Book Hotel Room”, a new page will come up through which admin or any hotel staff can book rooms easily. Admin or any Hotel Staff will select Hotel from the drop-down in which the customer wants to stay, select a date from the calendar, enter number of days and select Room Type. They can see Total Rooms, Available Rooms and Different Types of Rooms. Admin can also see room numbers with duration and status for each room. If the room is not booked for that particular time period, then admin can add the rooms in “Add to List” and if it is already booked then status will be “Booked”. After clicking on “Book Now”, the admin will see Booking Cart details and will have the option to create new Customers or select from the old customers. After selecting or creating a new customer, they will click on “Complete Booking”. 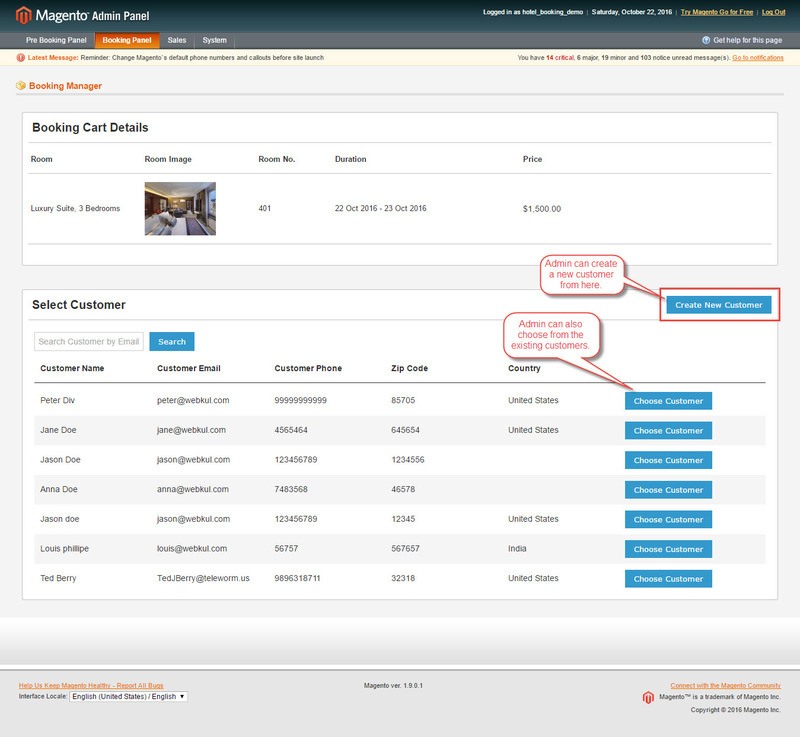 Admin can view the booking details for any customer under Sales > Order. Firstly, an admin will do the configuration for the pre-booking, by setting payment percent for the pre-booking and enabling it. 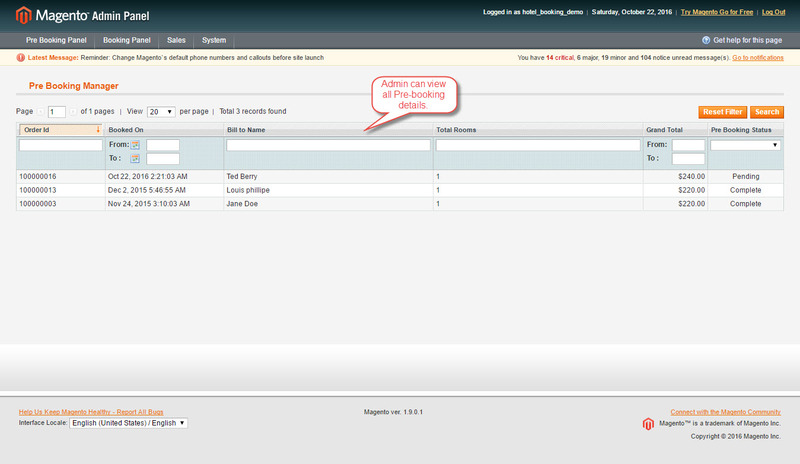 After pre-booking the rooms from the front-end, admin can see the pre-booking details under the tab Pre Booking Panel. Admin will complete the order after receiving the payment. 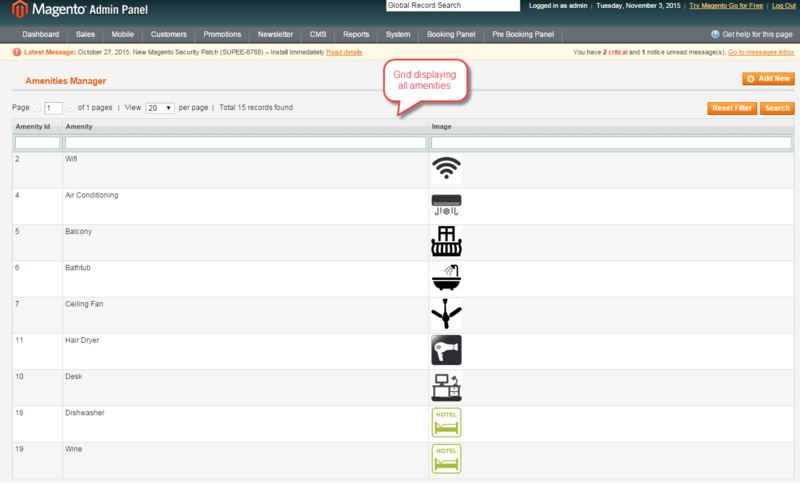 Here admin can view all the amenities created in the grid as per the image below. In “View Amenities”, admin can add various amenities which will be provided to the customers. Admin can select different amenities for different rooms. For creating or adding new amenity, just click on “Add New” and then you will enter the name of the amenity and upload a relevant image. Here you can create unassigned options which can be used as Drag & Drop while adding new Rooms. These options appear on this page. Admin can create new option by entering Title, Code and option values.